This card comes from Ashley via the Postcrossing forum. The Everglades are not only a National Park, but they’ve been a UNESCO site since 1979. Right now they are on the endangered World Heritage list because the ecosystem is so fragile. There are many endangered species who live in the park, such as the Florida panther, West Indian manatee, and sea turtles. 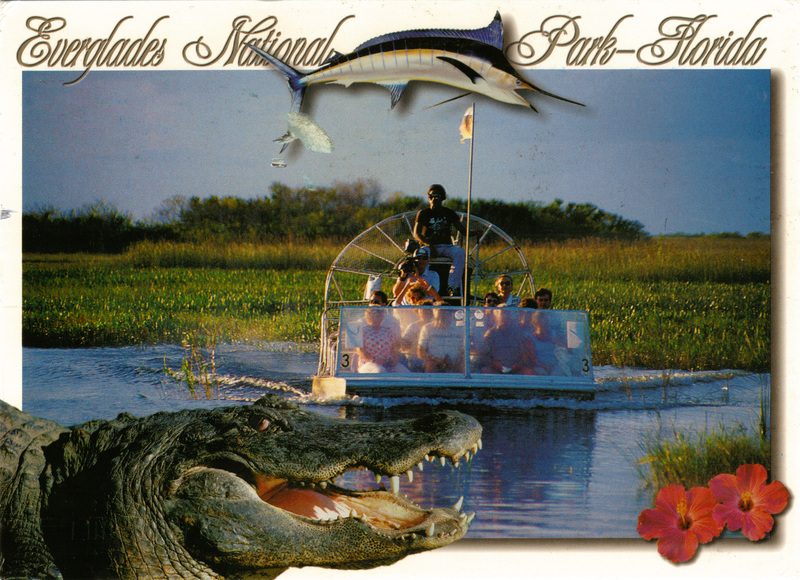 On this card you can see an alligator, which is often confused with a crocodile. Alligators have more U-shaped jaws that crocodiles, which have V-shaped jaws. Crocodiles can also live in saltier waters than alligators. Alligators are a common site in the Everglades; I remember many years ago when I visited there, we went on an alligator spotting tour. Many of them were sunning themselves on the side of the road as we drove past in an open-air tram. One person thought it would be a good photo opportunity if he reached out and petted one, until he was told off by the tour guide. I like this close-up of an alligator on a postcard: easy to see, and little risk of injury.